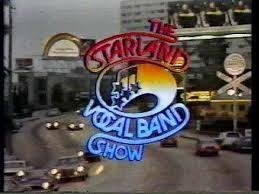 The Starland Vocal Band Show was a summer replacement variety show broadcast on CBS for six weeks in the summer of 1977 that starred the members of the pop band Starland Vocal Band, best known for their 1976 hit single Afternoon Delight. The show remains best known today for featuring a young pre-fame David Letterman among its cast. The content of the show was similar to that of most variety shows of that time, featuring musical interludes from Starland Vocal Band themselves, intertwined with comedy segments featuring appearances from Mark Russell, Jeff Altman, and Proctor and Bergman among others. Various recurring segments included the Starland members attending a Renaissance fair and exploring the abandoned Glen Echo amusement park, David Letterman dressed as a mailman reading viewer mail, Letterman interviewing various characters played by Jeff Altman and ending up punching them in the stomach, and brief segments from Mark Russell filmed in a Washington hotel. The show was generally poorly received due to its unfunny and repetitive humour, with Starland keyboardist Jon Carroll going on to regret doing the show, stating in a 2015 interview that “It wasn’t all bad. It was mostly bad. ", along with theorizing that it may have been indirectly responsible for killing the bands career. The YouTube channel StarlandandMore originally hosted all six of the show's episodes online with the musical segments edited out (presumably for copyright reasons). These videos have since been removed, however (again, presumably for copyright reasons), with only the first episode surviving via the Wayback Machine. On top of this, a video compiling all of Letterman's segments from the show, as well as a performance of Afternoon Delight have also resurfaced, with these videos being all that has survived from the show as of November 2018. Compilation of David Letterman's segments from the show. Performance of Afternoon Delight from the show. IMDb page for The Starland Vocal Band Show.